The main exhibition is designed by the Danish design company Kvorning Design & Kommunikation. The exhibition has a modern expression with a symbolic design. Especially the symbolism behind the number of seven, with assossiation to the mountain range The Seven Sisters, is consistent throughout the exhibition. There are texts and images in many formats, objects and listening stations provide knowledge and information in a way that will contribute to contemplation and reflection. Interactive displays allows for specialization, playing with words and knowledge testing. On the wall screens with short films are shown. These are called intermezzi. The films are depicting the four seasons, and is an artistic interpretation of quotes from Petter Dass, The Trumpet of the North. Elements are created by the Danish cinematographer Sten Georg with music by the composer Bodvar Moe. The exhibition is devoted to the heritage of Petter Dass. The exhibition also addresses topics such as religion in a multicultural society and issues concerning human management of natural resources today. In addition to the permanent exhibition there is a separate area set aside for changing exhibitions both in the main building and in the parsonage. This parsonage consists of two connected buildings. One part of the old manse is from about 1750 and contains two lounges with decor from the 1600´s and 1700´s. The youngest part is from about 1890´s and has got four rooms with changing and permanent exhibitions. Borgny Farstad Svalatog (born 1943) works are part of The Petter Dass Museum’s artistic décor and is located in the main exhibition. The works are designed as books in different sizes, inspired by the 1600´s books. The books in the showcases are located scattered in the exhibition area. Each book consists of a monotype and embroidered text ribbons. In addition there is a larger embroidery placed on a square base. Monotypes inspired by text lines from the psalm Lord God, your name and honor. “The book” is expressed through color and character with calligraphic qualities and appeal to musicality and association. 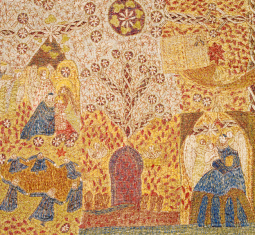 The embroidery refers to the four cardinal directions and the so called triangle churches at Helgeland. Since the early 1980´s, she´s become established as a prominent contemporary artist, and as a great renewer of church textiles and church art. 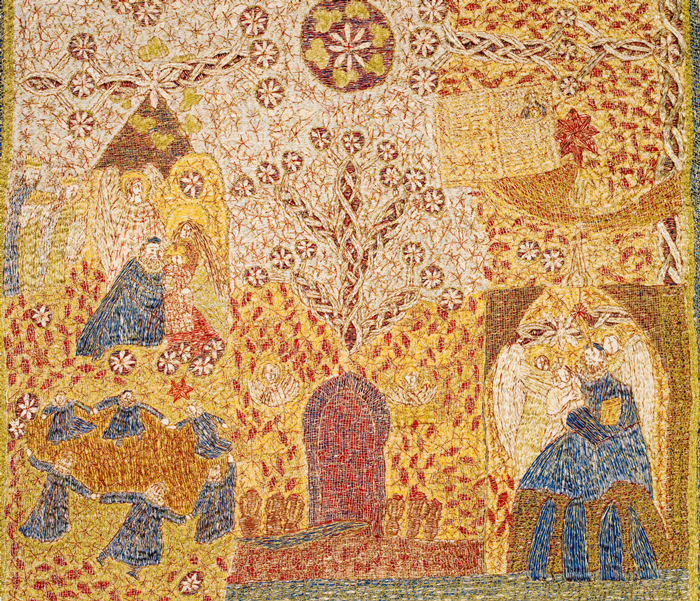 At Helgeland, she has made the church textiles both in Dønnes and Herøy churches. She was invited to make the exhibition for the main building by the Petter Dass Museum. The artist and illustrator Hans Gerhard Sørensen (1923-1999) from Stokke in Vestfold is recognized for his art production, not least for the illustrations to litterature written by Olav Duun, Jonas Lie, Tarjei Vesaas and Petter Dass. 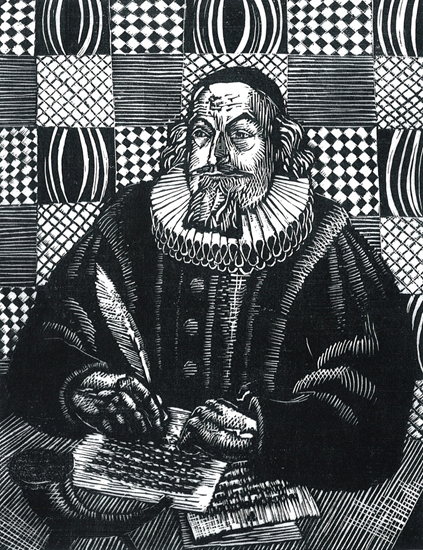 His specialty was woodcuts and xylographies, but he also used other materials. 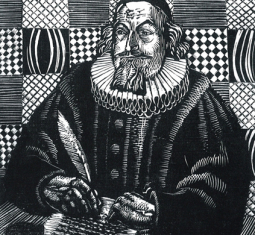 His artistic expression was inspired by older German woodcut artist as well as contemporary Danish graphic illustrators. Gerherd Sørensen is one of many artists who have worked with the art of Petter Dass writings. He has illustrated Petter Dass reinterpretation by Hans Kristiansen, The Trumpet of the North, 1962 and Collected Works 1 and 2, 1980. 21 of these unique original prints are donated to the Petter Dass Museum by Terje Navjord, one of the founders of the Norwegian food chain Kiwi. The exhibition is part of the permanent exhibition. 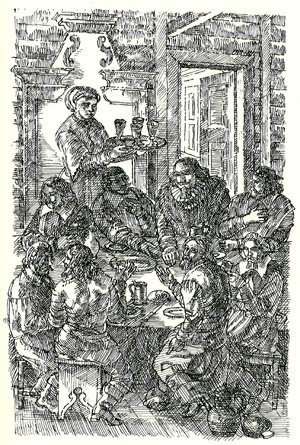 Karl Erik Harr (1940) has illustrated many books by and about Petter Dass. 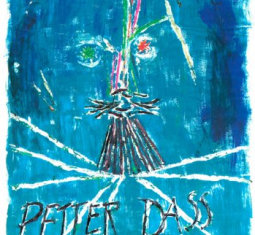 Themes from Petter Dass’s life and works are often used by the artist. 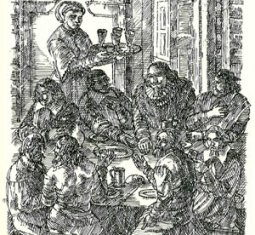 He illustrated the collected works (1980). He has also illustrated The Trumpet of the North (1989 and later editions). The latest edition appeared in 2006. Many of his Petter Dass artworks are exhibited in the old parsonage. 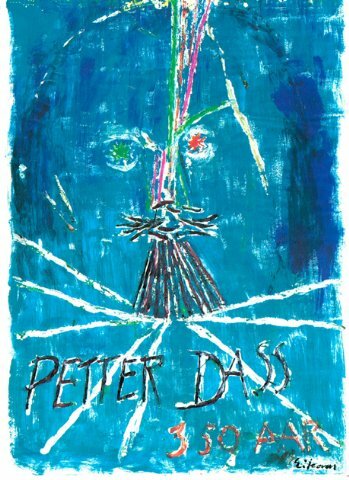 He has written and illustrated several books about Petter Dass.